Originally published in 1993. This study was written in 1946 having been commissioned by a large corporation in the food industry. The insights from this agricultural economics perspective even now are highly interesting. 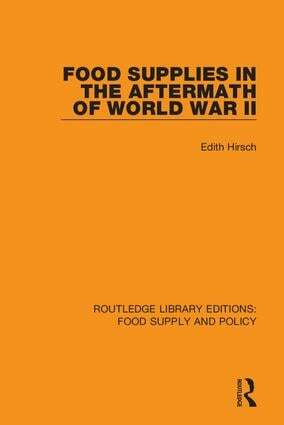 At the time there was real concern over food shortage and the UN and US government assumed there would be a problem for a long time to come. This study showed otherwise and set out suggestions for food policy and foreign aid policy with regards to food. This thorough study is an exemplary snapshot of the history of food policy and has lessons still to share. Edith Hirsch was a commodities economist who ran a consulting group with her husband, Julius, in New York. She was a consultant to the Department of Agriculture in the 1940's and 1950's.